Williamstown, whose original (and still official) name is Templetogher, is a small rural parish in the North-East of County Galway. In the year 2000, Williamstown Heritage Society was founded with the aims of increasing awareness and raising the profile of all matters relating to heritage, whether they be natural, cultural or built. 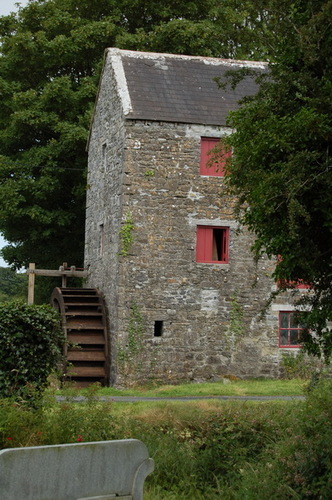 Shortly after its founding, the society became aware that Templetogher Mill, a disused corn mill and a landmark building in the locality, was on the market. The members decided that they would try and raise enough money to purchase the mill on behalf of the community. A major fund-raising drive was launched and thanks to the outstanding generosity of our parishioners, of those living in neighbouring communities and of those of our own people living away, the agreed purchase price of €38,000 was raised in a comparatively short time. The deal went ahead and the mill and surrounding land are now in the ownership of the community. The building was, of course, in need of repair and we sought the advice of one of the top experts in this field, industrial archaeologist Fred Hamond, Belfast. On his advice, step 2 in our campaign (the actual purchase being step 1) was to conserve the building and thanks to generous grant aid from the Heritage Council and Galway County Council, this work was carried out by a private contractor, hired by the society. The immediate area where the mill is located is steeped in history. 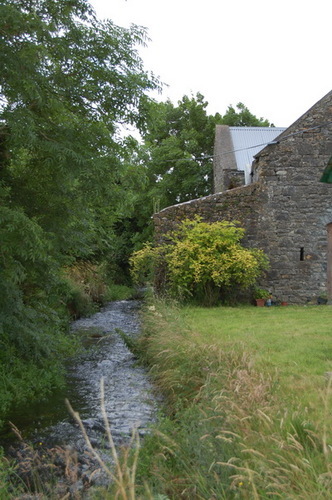 In very close proximity to the mill and kiln are St. Patrick’s Well and Shrine, our oldest cemetery, Templetogher, which contains the outline of our earliest church, a quern stone and the remains of a lime kiln. Because of this, we decided, for step 3, to commission an overall Development Plan for the area and for this plan, which was most comprehensive, we got generous funding from Galway Rural Development. Next came the actual restoration of the mill and for step 4, as always under the guidance of Fred Hamond, we undertook the reconstruction of the mill wheel, a major task. The work was carried out by one of the experts in this field, Pat Sheehan of Tipperary and again, generous grant assistance was forthcoming, from the Heritage Council and Galway Rural Development. Step 5 was the landscaping of the land which surrounds the mill and this involved the laying of gravel paths, the uprooting of non-native trees, the planting of large numbers of native trees, the purchase and positioning of a picnic table and a bridge over the mill stream and the developing and planting of an organic vegetable garden. This step was again grant aided, this time by Galway County Council by means of an amenity grant. In addition to the generous grant assistance received from the various agencies, we were also greatly helped by local Fás and Rural Social Schemes and through these, much important work was carried out in the Templetogher area. Step 6 involved the development of an authentic forge in the lower part of the building which houses the kiln and of immense benefit to us here was the fact that the entire range of tools and equipment from a local forge, that of Pat McLoughlin, Williamstown, was donated to the society by his family and these are now in place in the newly-developed forge. Step 7 involved the restoration and development of the corn kiln on the floor immediately above the forge and this has proved very successful also. Further assistance was forthcoming from Galway County Council again, this time in the form of two Heritage Grants, with this step of the development. In keeping with another of the main strands of heritage, for step 8, we embarked upon a bio-diversity project, through which an additional number of native trees was purchased and planted, security fencing was put in place and bird feeders and nesting boxes were purchased and positioned. Step 9, the reconstruction of the inner workings of the mill, is now complete, and thanks to the guidance of Fred Hamond and the skill of our workers, led by the incomparable Lal Finnegan, it has all come together beautifully. 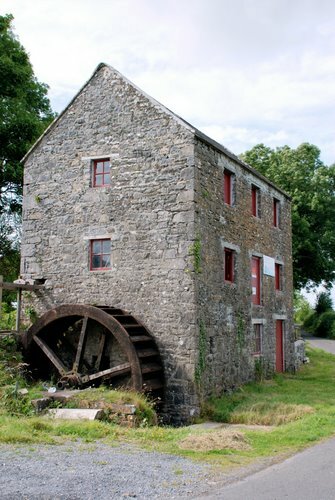 The Heritage Council in Kilkenny has again proved to be most supportive in this step as it has supplied us with two grants, one to fund the drawings by Fred Hamond of the plans by which the mill machinery could be restored, and one to help fund the restoration of the hurstings, a technical and important job. The general public had an opportunity to see all of these developments for themselves on Sunday, August 30, 2009 when there was another Open Day at the mill, as one of the activities of National Heritage Week, when all the workings of the mill were in operation once more as in its heyday. Step 10 had also been completed by then, through which 9 information boards, detailing the milling process, were put in place. On that day, a plaque, acknowledging the great contribution made by the Egan family, Templetogher to the milling tradition in the locality, was unveiled by Sara Agnes Lennon, Derryvode (a member of the Egan family). Impressive though the Templetogher Heritage Area was by then, the development did not stop there. A good selection of old farm machinery had been acquired by the society, and in order to house these items and a number of other important artefacts, it was decided to erect an additional building, which would serve as a simple museum, on the site. All of the work on this project was done by local people, including our own members and others who are always very supportive. This building was officially opened at another Open Day at the mill, during Heritage Week 2012, when the President of Williamstown Heritage Society, Paddy Forde, cut the ceremonial tape. Needless to say, 2013 was another special year for Templetogher Mill as this was the year of The Gathering, a nationwide effort. The Gathering Weekend in Williamstown was in August, and following the very successful launch of our book "Williamstown/Templetogher Parish - Our People and Landscape" on Thursday, August 22, we had another very successful Open Day at the mill on Saturday, August 24. This gave an opportunity to those who had not been home for some time to see the vast amount of development which had taken place in Templetogher in recent years. Now that 2014 is upon us, the development continues. The restoration of the miller's house is well under way and we are confident that it will be completed this year. Also in the plans for this year are the upgrading of the kitchen and toilet facilities at the site. The many positive comments which we continue to receive from visitors to Templetogher are a source of great encouragement to all of us in the society, and there is no doubt that the area looks very impressive and, as so many people point out, peaceful. We are confident that the continuing development at the site will enhance the area even further.